I grew up in New England, which meant that stone was literally everywhere (thanks, glaciers!). With all that around me, of course I have a deep and abiding love for natural stone. A lot of our landscape installations are flagstone patios and walks. Here are some favorites. Believe it or not, when we started this Sperryville landscape design project, no one ever used the front door! We built a flagstone walk from the parking area to the base of the stairs. Now, their guests get to enjoy the mountain views from the wraparound porch. This flagstone patio in Culpeper, Virginia is made with squares and rectangles of Pennsylvania flagstone. To make the surface as smooth and even as possible (it’s part of a winery landscape design, after all) we used what’s known as thermaled flagstone. How do you take a a tight backyard and still make the patio feel spacious? Look at the detail we created with this Bethesda flagstone patio design. Curved borders are expertly cut into the pattern of squares and rectangles, helping to define individual spaces while still keeping everything on one level for safety and flexibility. For this Vienna patio design, the client didn’t need a huge space. This flagstone patio sits immediately adjacent to a large deck. When I first saw the yard there was a massive yew hedge cutting off views of the beautiful water feature just beyond the hosta. Simply eliminating the hedge and grading everything flat changed the space. Oversized slabs of flagstone give the area a feeling of permanence, while gaps jammed full of dwarf Mondo grass (Ophiopogon japonicus ‘nana’) tie the patio to the lushly planted backyard. Simple, yet elegant. For this flagstone patio in Culpeper, we again used Pennsylvania flagstone on a concrete base. Located at Old House Vineyards, you can check it out for yourself! These Arlington, VA flagstone landings punctuate a long run of timber steps that turned a nearly inaccessible backyard into an entertaining hub for the neighbors. With such a great looking Craftsman home in an historic Alexandria neighborhood, I wanted to use a unique stone that complemented the age of the home. Dark charcoal gray Westmoreland flagstone blends with the colors of the house and the pattern of the walk is a nod to historic landscape styles. Homeowners looking for a more relaxed feel for their backyard opted for an irregular flagstone patio. To create a unique color palette, we used Tennessee variegated flagstone with a border of Canyon View flagstone. We also did an unusual Haymarket outdoor kitchen at this property. This driveway in Culpeper is primarily gravel, with a paver parking pad. The home in the photo is an attached mother-in-law suite, so we wanted to create a hard surface at the front door for those who may have mobility issues as they age in place. The existing front walk was just too small (and boring too). So for this Gainesville paver installation we created a generous landing at the front door. The boulders were set in place first, and the pavers were meticulously cut to fit. The owners of Old House Vineyards approached me to create a space for outdoor functions on the shores of their farm pond. Walnut colored travertine marble pavers were the color inspiration with which I started, and an unusual plum-colored flagstone creates the border. In terms of color palette and style, these clients were very much still in love with the landscapes of their prior home in Colorado. The travertine and stone veneer worked beautifully with the new stucco on the home. We created this gravel patio for clients in Chevy Chase, MD. 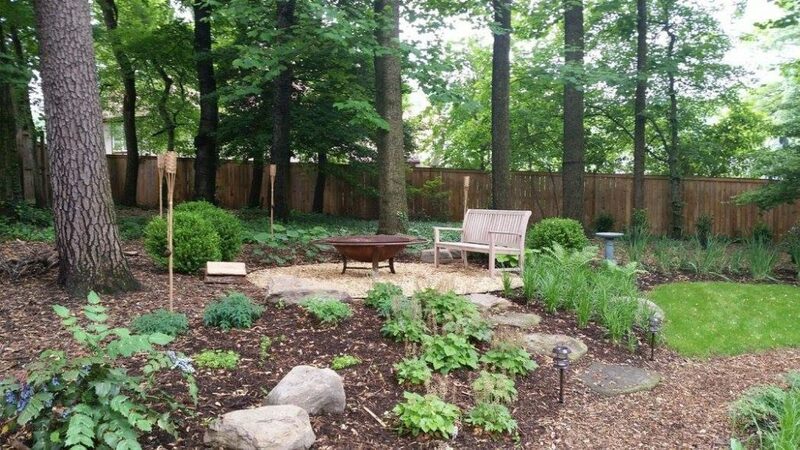 You’d never guess that this serene, wooded backyard was a stone’s throw from the Beltway, and our choice of a gravel patio helped maintain the natural feel. That gorgeous firepit you see is from firekettles.com. This gravel patio is in my backyard. Originally planning to use pea gravel, we instead opted for a ¾” stone called Chalet. The colors complement the rest of my stonework, and the larger size stays in place – even when both dogs see a squirrel and hit the afterburners.